The company sells soccer jerseys, soccer apparel and team uniforms. Obviously, its product is very diverse and it manages to include numerous soccer club jerseys and national jerseys. Many others are available in the menu bar, and each category is nicely divided into sub-collections. When you roll the cursor over one of the categories, you see a large list of sub-collections unfold. From here, you can very easily start browsing the desired products. Most replica soccer jerseys available at GoalJerseys.co are very affordable. A large part of the soccer jerseys cost about $24.99-$34.99. The ones that are pricier are the throwback jerseys and these cost about $29.99-$39.99. From my point of view, these imitations have very decent prices considering their quality and design accuracy. The description page of these soccer jerseys is very nicely constructed. It is a very comprehensive, and it represents a detailed presentation of the most important particularities, functions and materials of these knockoffs. 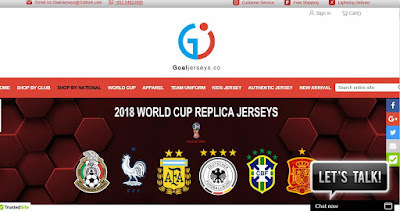 All of them are very well organized and explained as to offer a clean and reliable description of the quality available for these replica soccer jerseys. On the bottom of the page it says that the accepted payment methods are Visa, Mastercard, Western Union, money gram and bank transfer, where Western Union , money gram and bank transfer orders get a 5% discount. Only that, after checking out, the Order Form shows two options: “Card Payment Option 1” and “Card Payment Option 2” without saying what each one means. This is very unprofessional and I feel that not respecting the statements you make on the website about the available payment options is a clear sign that your company cannot be trusted. GoalJerseys.co offers free delivery by EMS and in this case the estimated delivery time is 5-15 business days. That is a lot of time to be waiting for a soccer jersey thinking whether you will ever going to receive it and if it is the quality is good or not. If you want to speed up the delivery and receive the order by DHL in 4 to 7 days then you can pay an extra charge of $15. This will ensure the speedy and safe delivery of your order as well as a tracking number for it so you can follow its progress online. It seems that the company offers a 365 days refund and replacement warranty. No matter for which reason you are not happy with your purchase, the company will accept your return. Furthermore, all return fees must be paid by the customer. The refund will be issued using the same payment method as for the initial transaction.. 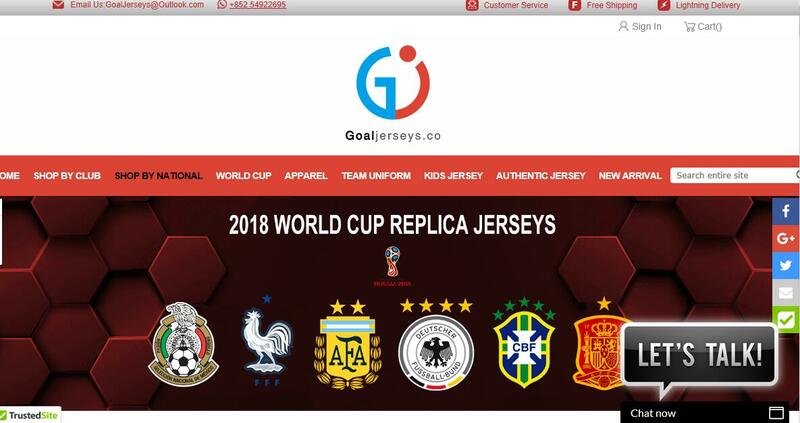 The company does not fail to pass as a reputable and professional retailer of high end replica soccer jerseys and this is mainly because of the good customer service it has. A reliable store knows the value of customer service and it invests time and effort into supplying a customer care department that is available by phone, email and live chat. These communication channels are essential for keeping an open and close relationship with your customer and potential shoppers. The website has a contact phone number, a company email address or a chat button. When you are dealing with online replica merchants, it is very easy to be fooled by a pretty looking website, low prices, beautiful pictures and the promise of free delivery. Usually, only upon a close look you discover that the free shipping means a slow delivery time. Before you order, pay attention to all the details and this will protect you from all the possible risks of ordering a replica online.